We all use amchoor or khatai or dry mango powder in many recipes. I use it in almost all of my recipes. Imagine the taste when instead of using store bought powder, you can enjoy the goodness of raw mango year round. There are certain recipes which uses raw mango and do not turn out as good when mangoes are not in season like bharwan karela (stuffed bittergourd) or aam ka panna, now you can enjoy these recipes too year round if your freezer is big enough. In a potluck last year, a dear friend Ravaly Chelimala treated us to raw mango rice in the month of October. We are all stumped! How can you get raw mangoes in October?? 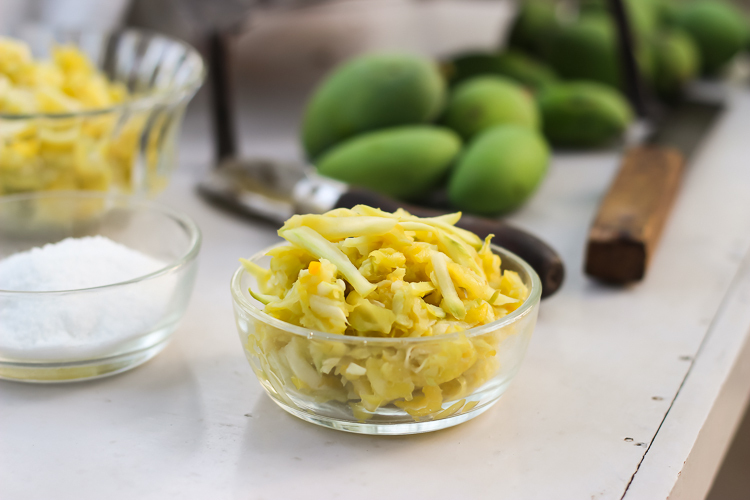 Then she shared her secret about freezing the grated raw mango for the year round. I waited for summers to come and learn how to do that from her. I didn’t just preserved for myself but also over 10 kilos for my mother. While I was at my home town, it rained heavily bringing down kilos of mangoes and we put them to good use. The preserve stays for a long time in freezer. You can adjust the amount of salt used depending upon your preference. I have frozen it without salt too when I knew it would be used within few weeks. Make pickle, add to veggies instead of amchoor, rice, dals (pulses) or anything you wish to create. Give your recipes a new tanginess.